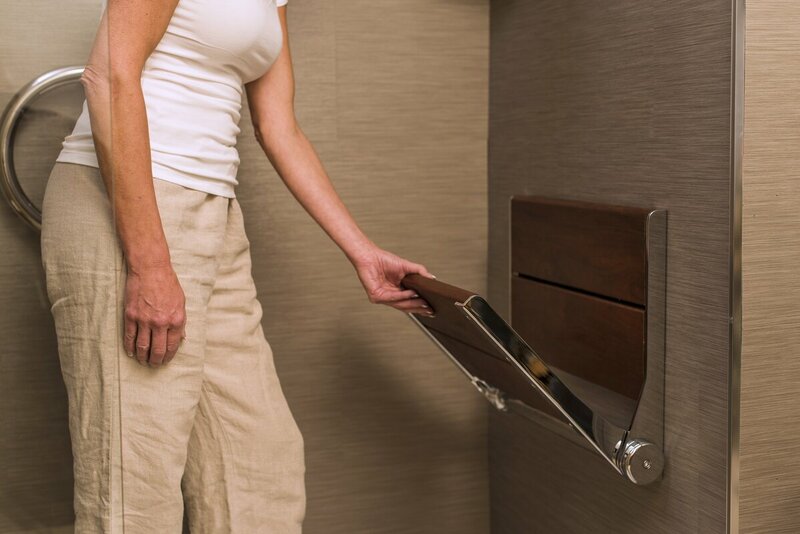 While the main purpose of shower seats or shower benches is to aid senior citizens or people with disabilities who can’t stand up, many furniture and appliance manufacturers have been marketing these products as luxury devices such as the best shower pan. People have found convenience in shower seats when they need to scrub their feet, shave their legs, or have a steam bath in the shower. The great thing about modern-day shower seats is that they’re really easy to install. That said, the only question you have to ask yourself is which brand you should buy. While all shower seats have pretty much the same function, each product has its own set of features to brag about. To make things easier, we have compiled a list of the best shower chair brands. This will help you narrow down your choices so you can pick the one for you. Made of beautiful teak wood, this one makes a great addition in your shower. The design itself gives off a luxury vibe that you can see in most luxurious hotel shower spaces. One of the best things about it is that it can be folded up. That way, it won’t take up that much space if you don’t need it. It is also very easy to install. All you need is a screwdriver, drill, and hammer. It is both beautiful and practical at the same time. 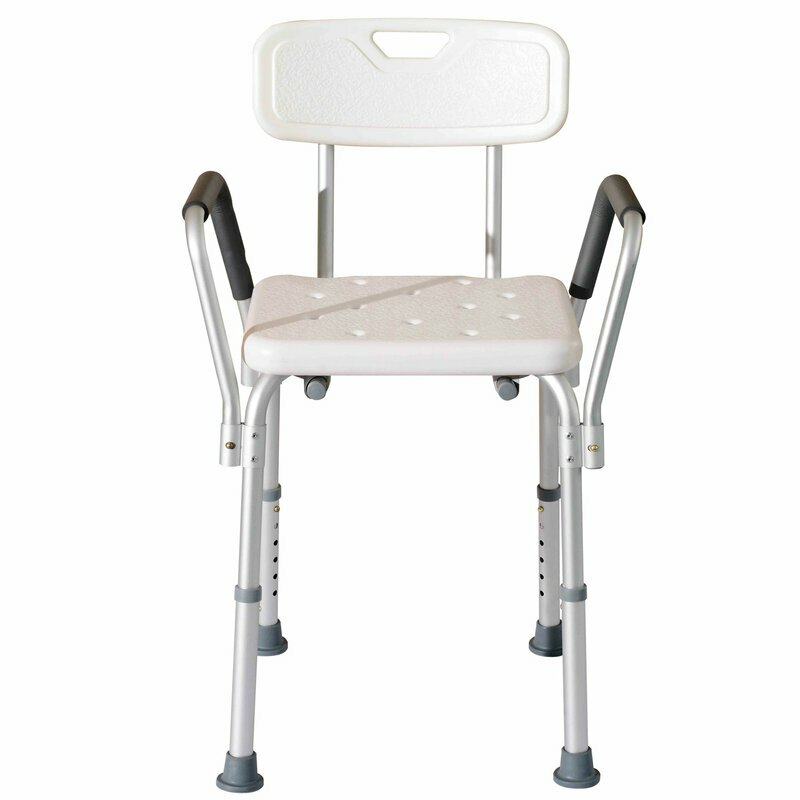 The HealthCraft shower chair is a very easy to use spa wall mounted chair. Since it is foldable, it will look as if the chair isn’t even there. This saves up on a lot of space in your shower. What makes this product rather unique is that the seat is made of moisture-resistant bamboo, allowing you to feel like you’re in an actual spa. Even though it’s not that bulky, it’s very sturdy due to the special tension hinges that come with the chair. 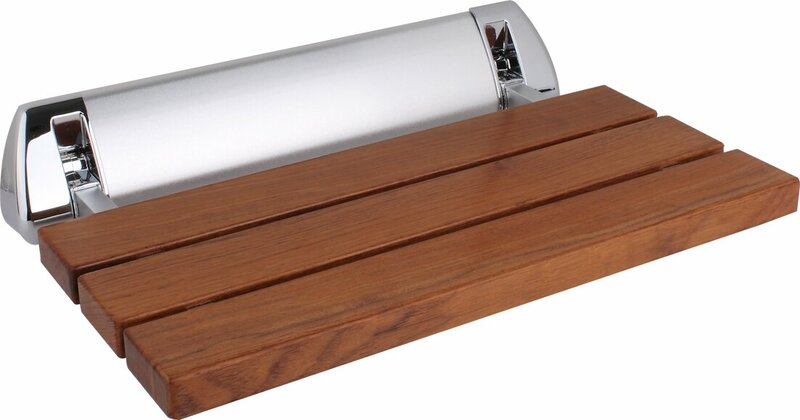 If you want something that is not so lengthy but wide, then the Amerec Teak shower seat is for you. 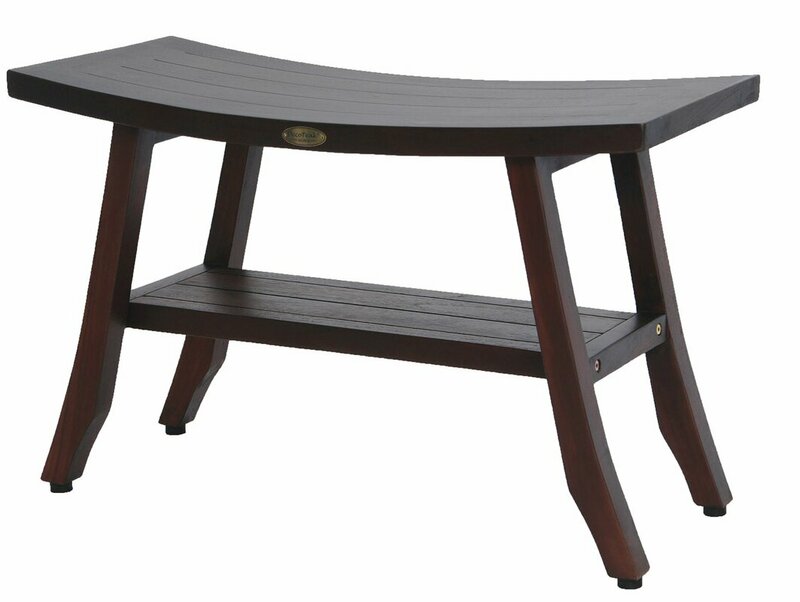 Just like the first product, this one is also made of teak wood, making it very sturdy and durable. What you’ll love about this product is the very subtle look that it has. It’s not that long compared to other seats, which means that it won’t take up so much space. It’s also foldable, meaning you can tuck it away if you’re not using it. All you have to do is pull it open to bring it down and then push it back up to hide it. 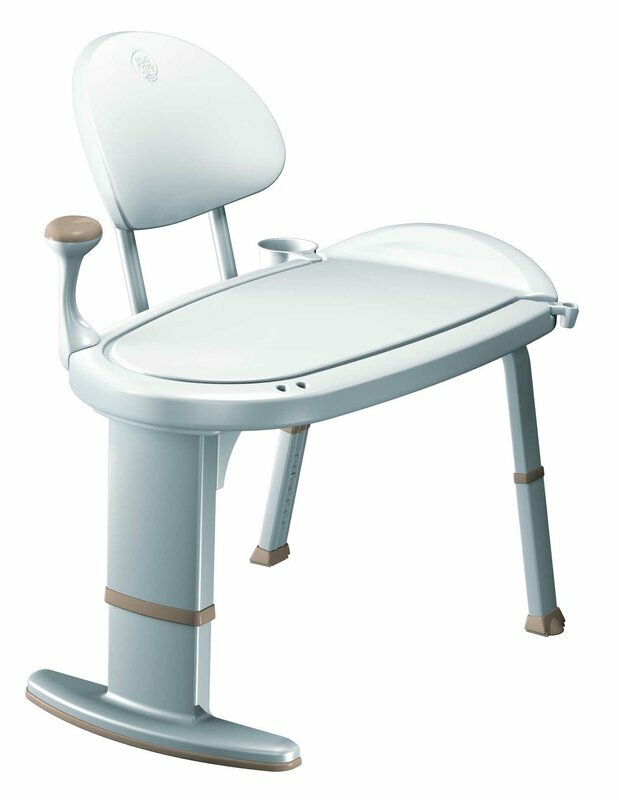 The HomCom Medical shower seat is one of the most durable seats offered for assistive purposes. It is actually built of a very sturdy aluminum and polyethylene, making it very much suitable for overall shower use. In order to further cater to those with assistive needs, the legs also come with special suctions that steadily stick to the ground even though the ground is wet. It is perfect for both senior citizens and persons with disabilities. The most unique thing about this shower seat is that it has a very nice design. The design is actually inspired by Asian health spas wherein they have that kind of chairs in their shower rooms and hot tub areas. You’ll also notice that the color and feel of the teak wood is very different from the usual teak wood of shower chairs. This is because the EcoDecor makes use of a special finishing technique that makes the texture different. The overall architecture is very unique and special. Moen is known for making the best shower seat products for the elderly and those with assistive needs. As compared to most brands, this one has the sturdiest legs. 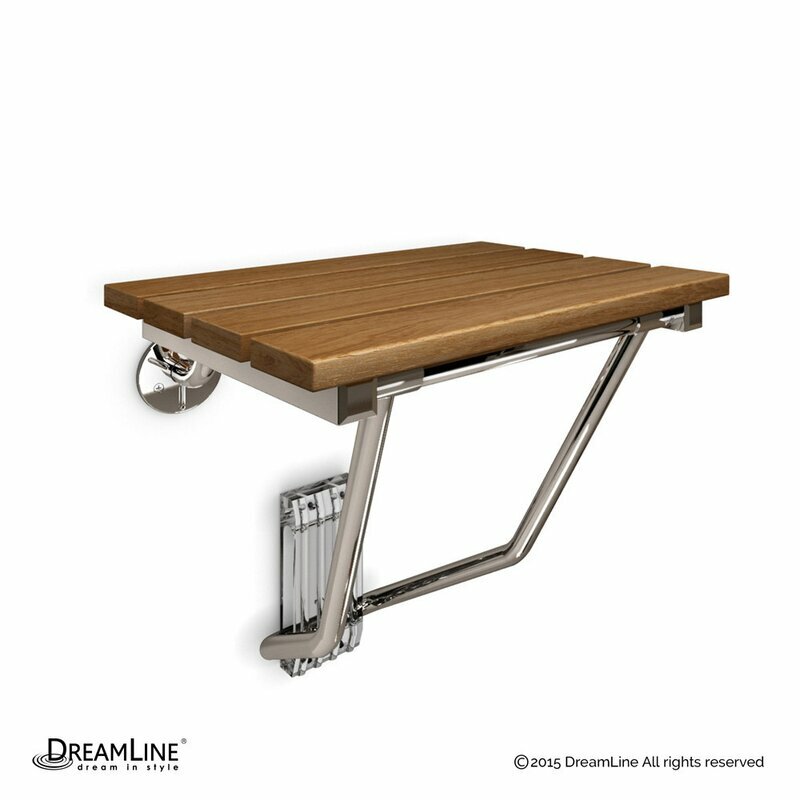 That’s because the legs of this chair are built for heavy-duty use and are anodized. In fact, the chair itself can take up to 250 pounds of weight from anyone who sits on it. 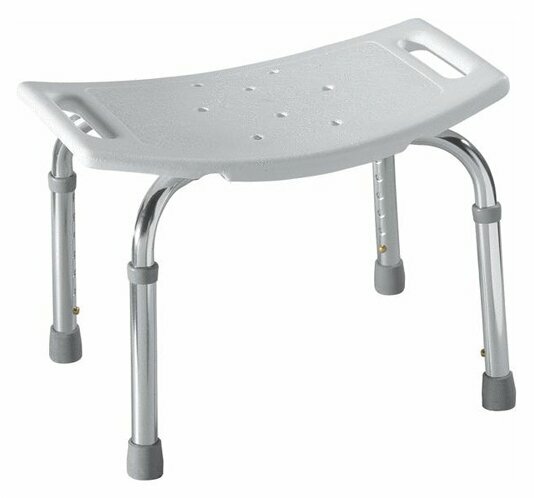 It also has a special non-slip feature so that you won’t slip off the chair even when it is wet from the shower. This is another teak wood shower chair that is built like the ones that you can find in the spa. Due to its overall design, it adds a bit of a rustic touch to the shower’s design. 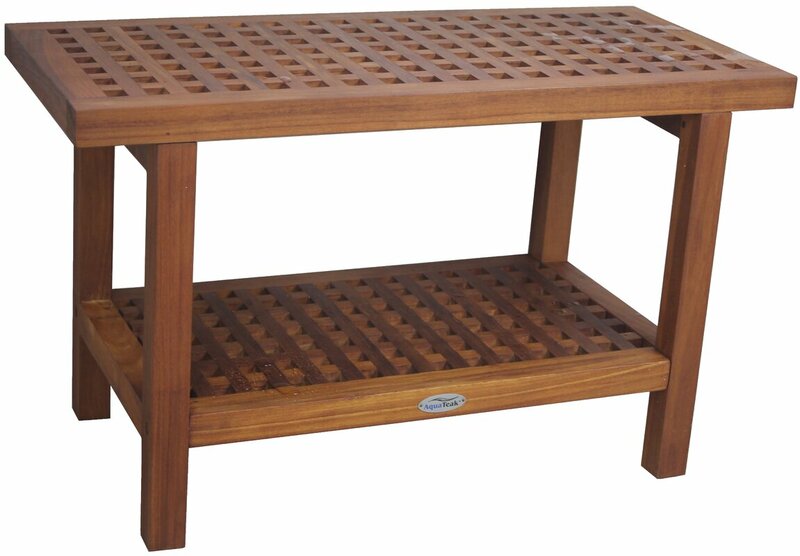 The teak wood is beautifully finished and the design is very practical. There is a section underneath the chair that can hold your toiletries such as your soap, shampoo, towel, hand cloth, etc. 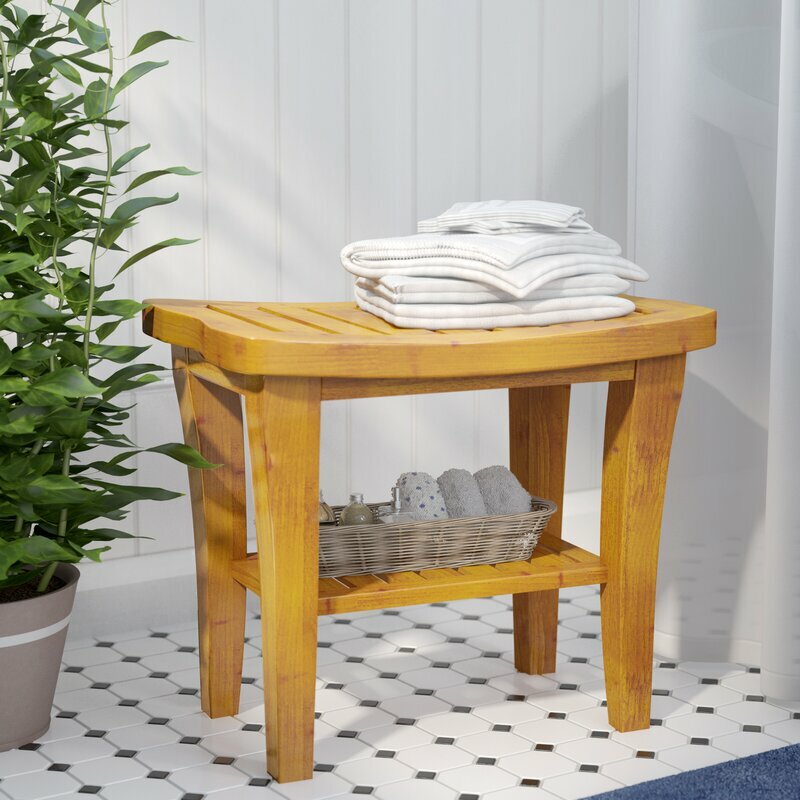 Not only can it be used as a shower seat, but it also doubles as a toiletries holder that can be right outside of your shower. One of the best things about this shower seat is that it is not only used as a shower seat but also as a small shower table just like the previously mentioned brand. The design is a little different as compared to the last brand though. Instead of the usual horizontally placed beams, this one has a grated design which makes it a bit sturdier. 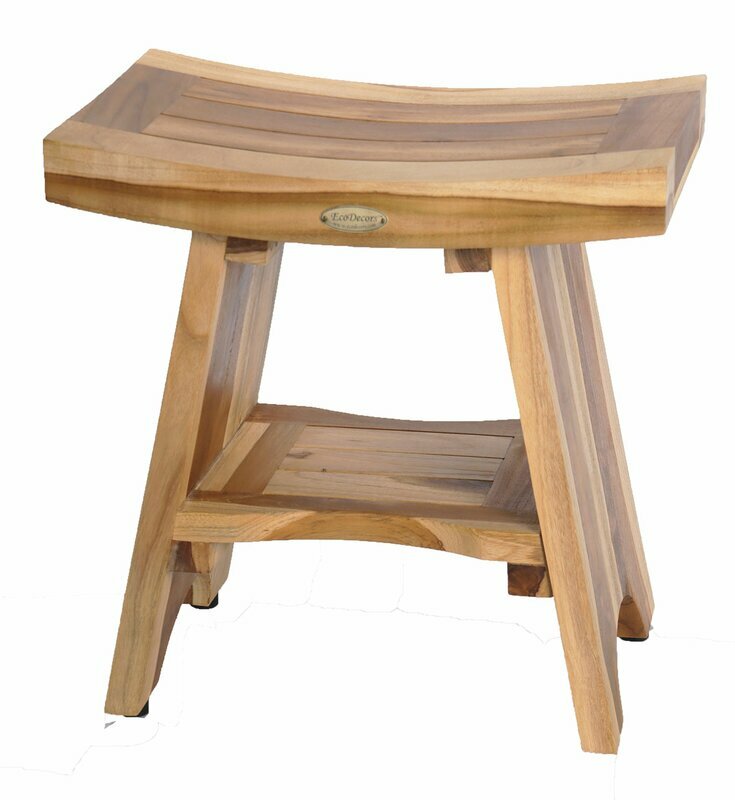 As the size is pretty robust, it’s great for being a shower table stand as well as a bench. This is one of the best shower chair brands for decoration, especially if you like Japanese designs. The chair slightly resembles the built of a Shinto gate, like the ones you’ll see in Japanese architecture. Since it’s pretty long, probably around two people can fit on the bench. It’s great for the bigger showers wherein you have enough room to keep the chair. Also, it includes a foot leveler pad that can allow you to adjust the overall height of the chair. Also, it has its own built-in shower holder and toiletries holder for more convenience. Lastly, it comes with an easy grip support handle which allows you to hold on to the chair without worrying about falling. It’s one of the best assistive chairs you’ll ever find in the market. These are some of the best shower seat products that you’ll be able to find on the market. As you can see from the list, there is a combination of both assistive shower seats and luxury shower seats. This allows you to know what exactly will cater to your own needs – whether you need one for an elderly person/person with a disability or maybe just a luxury piece of furniture to make your bath time more relaxing in the same way that the best shower pan would. Now, the choice that you will make will depend on your own needs when it comes to shower seats. The key features are all listed so that you will know how each product differs from the rest. By taking note of all the features of the products, you’ll know which features suit you the most. That way, you can make a very careful choice for the best shower chair that you can have for your bathroom.